When you need to do meetings for brainstorming, visioning, small group planning or team building, the best results are achieved by leaving your familiar surroundings. At The Rookwood Inn you will find a comfortable, casual environment where creative juices flow freely and our staff is at the ready to exceed your expectations. Located in Lenox, the heart of the Berkshires of Western Massachusetts, we are the perfect midpoint between New York and Boston, and an easy drive from Bradley airport (Hartford, CT) and Albany. 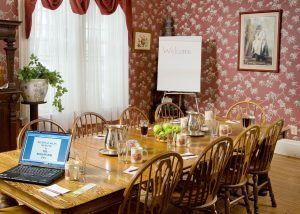 Your attendees will be able to meet at our location in the quaint village of Lenox. We will give you 100% of our attention because we don’t schedule more than one meeting at a time. You won‘t find hard fluorescent lighting or hard-edged hotel meeting rooms serviced by indifferent staff members. 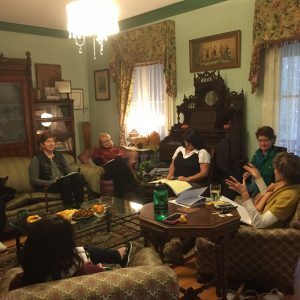 At The Rookwood Inn, one team member will be assigned to work with you to tailor a day, or more, to fit your group’s needs and interests. Because of our size, we can be creative in helping you plan your work time and down time. Our in-depth knowledge of the resources in the community allows us to work with you to plan outside the facility team building experiences. We will set the stage and make your event perfect! Set up a time to talk with our meeting planner about your needs here.